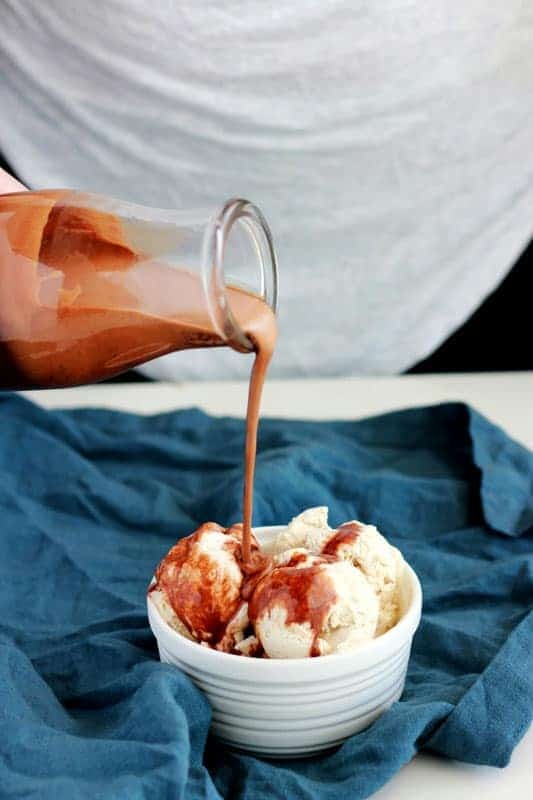 Make your own rich and creamy Homemade Chocolate Syrup with this easy recipe! All you need is cocoa powder, milk, sugar, and vanilla extract! Stop the presses. My toddler actually asked me for chocolate milk politely! This NEVER happens, so of course I run to the refrigerator to whip him up a glass. We were out of chocolate milk mix. I glanced over at his angelic little face and knew that I had to do something. 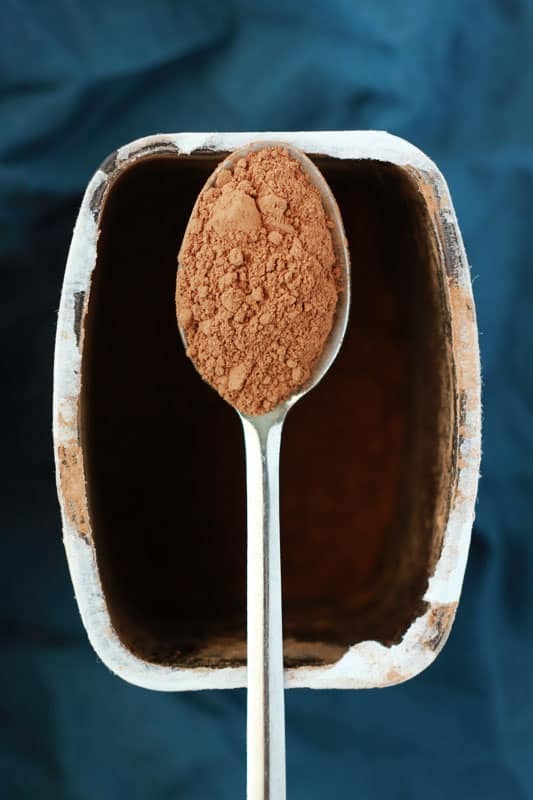 A quick check of the pantry led me to the cocoa powder. I rolled up my sleeves and got to work. The end result? 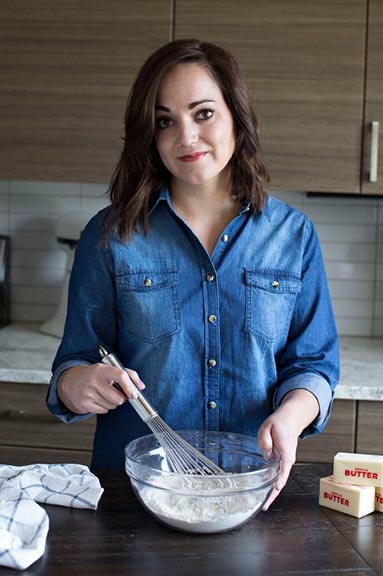 This amazing recipe. 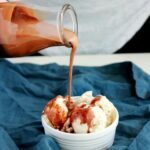 With just four ingredients, and five minutes of my time, I was able to make the most incredible chocolate syrup recipe. I had no idea a homemade syrup was such and easy recipe. It tastes exactly like the syrup you purchase at the store only better. You know… Because it is made with love. Combine cocoa powder, milk, and sugar in a medium saucepan. Bring to a boil and allow it to simmer for 1-2 minutes, or just until the sugar has dissolved. Remove from the heat and stir in pure vanilla extract. The thing with this recipe is that you are only using FOUR ingredients which means you need to use quality product. I am not saying you need to spend an insane amount of money on cocoa but do not buy the off brand. Same goes for the extract. Make sure you splurge and spend the extra $1 on Pure Vanilla Extract (off brands are ok here since it is hard to mess this one up). If you compare pure to it is imitation counterpart you will notice a big difference. 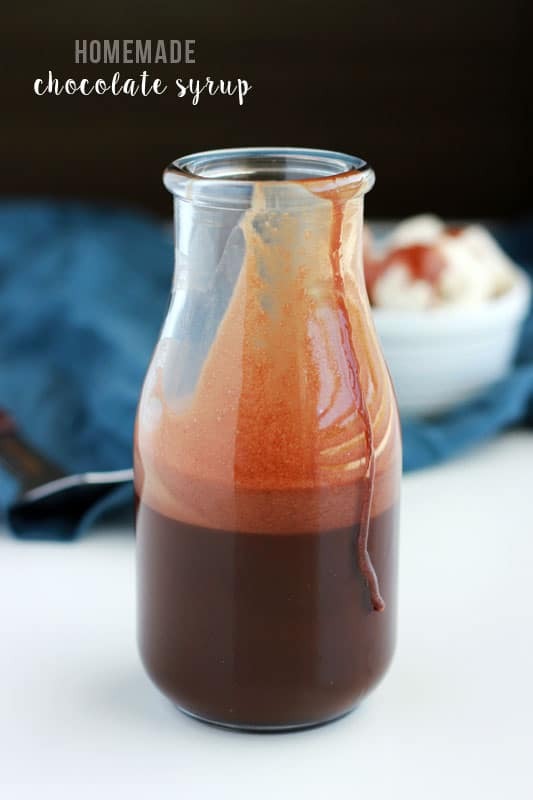 This syrup is ideal for serving on ice cream, making chocolate milk, or inside a milkshake! The possibilities are endless. Like this recipe? 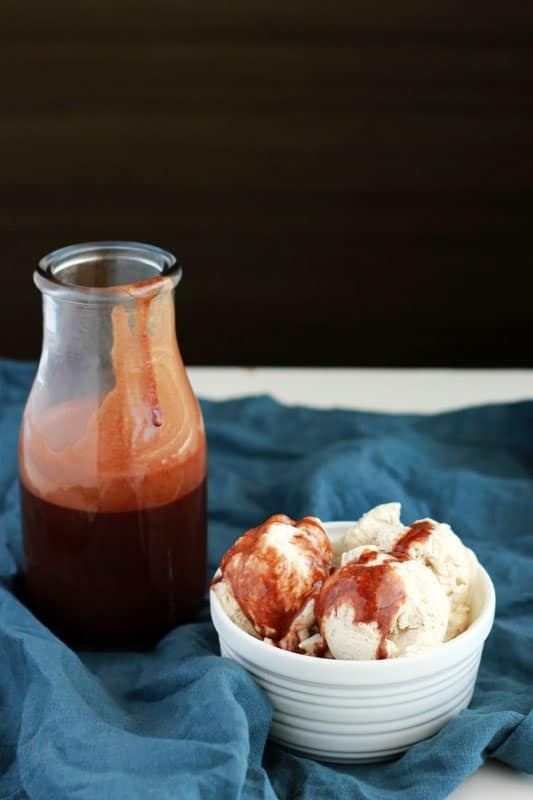 You will love my Salted Caramel Sauce, Strawberry Sauce, and Gingerbread Syrup! Whisk together your cocoa, milk, and sugar in a medium sized sauce pan. Bring to a boil over medium heat making sure to whisk continuously. Boil 1 minute or until the sugar is dissolved. Remove from the heat and stir in vanilla. Chill. LOVE this idea! 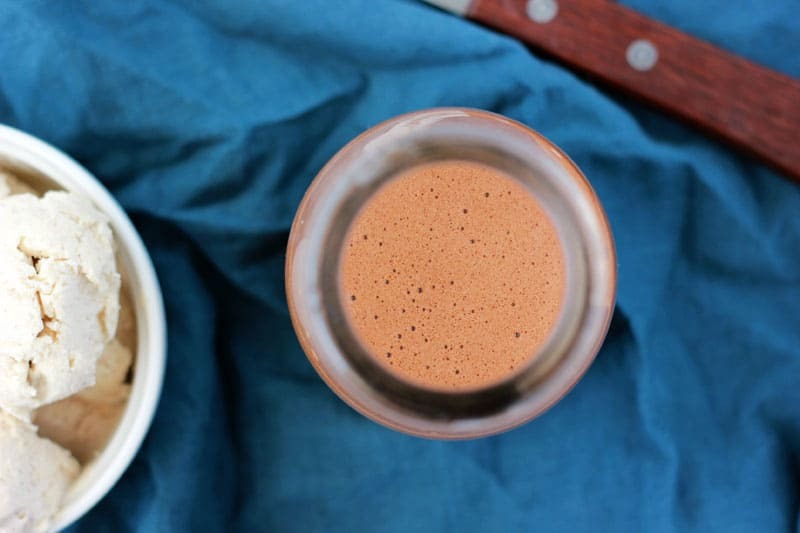 Do you think it would work with homemade almond milk or cashew cream instead of whole milk? I would assume yes… but I’m not positive. If you try it let me know how it comes out! I have seen this idea floating around and yes… the Chocolate Mom has still not tried this recipe. I would vouch for using high quality cocoa, I would also please ask to look for ethically sourced cocoa. Thanks and pinning! Wow this looks great and very simple. Thanks for the yummy idea. Mmmm! Thanks Jesseca! I’m pinning this and trying it this week. Does it need to be refrigerated? How long of a shelf-life does it have? Thanks–it looks great! I’m wondering about the shelf life as well. I would most definitely refridgerate this as it has milk in it. Thanks for the recipe. could you use “Stevia in the Raw” instead of sugar? I have actually never tried it. If you do, please come back and let us all know how it works out! Found you on Food Holiday Link Party. Love this idea and pinning it. thanks for sharing…i’ll try this! I was just wondering how long will it be good ? Just made this in the microwave actually. Turned out great. Didn’t have sugar so I used powdered sugar and I added a pinch of salt. I think it brings out the flavor. This was so much better than comparable recipes using water. Thank you! My girls really loved this. I also stored it in one of those shaker cups with the blender ball. That way if it separates a little then it will be easy to remix. Great tip! I’m glad it worked out well! I’ve made this several times. Love this idea and doubt I’ll ever go back to store bought. My only problem is sometimes I end up with chunks I’m the syrup, no matter how much I whisk and whisk it. Any ideas why this would be happening? Sometimes I add the cocoa and sugar after the mill has heated up. Could that be a problem? Does anyone know?